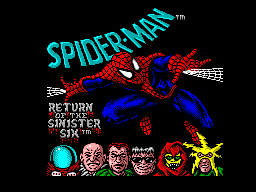 Spider-Man: Return of the Sinister Six is a Sega Master System and Sega Game Gear action game starring Spider-Man. The game is infamous for terrible controls. Spider-Man: Return of the Sinister Six is a platform game in which Spider-Man has to defeat each member of the Sinister Six (in this case, Electro, Sandman, Mysterio, Vulture, Hobgoblin and leader Doctor Octopus). This lineup is the one which debuted in The Amazing Spider-Man issue #334 (dated July 1990). Main article: Spider-Man: Return of the Sinister Six/Magazine articles.